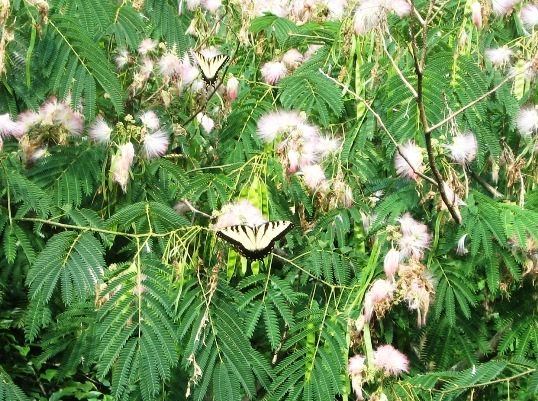 This afternoon while The Squire and I were feeding the fish, he happened to glance up and noticed that our Mimosa tree was covered with Monarch butterflies. We tried to take some snaps from the ground, but I ran upstairs and took several, including a video, through the bedroom window. It’s hard to get a sense of how many there were, or how much bustling around was going on in a still photo, but there are three in this shot, which may give you an idea. It might also explain why our hummingbird feeder hasn’t been getting much traffic.